Hey Everyone! Happy 2018! I haven’t seen you guys since last year!! So, my last hairstyle was my Cinderella French Braids, and, to keep with the theme, I decided to master Moana’s curly locks. 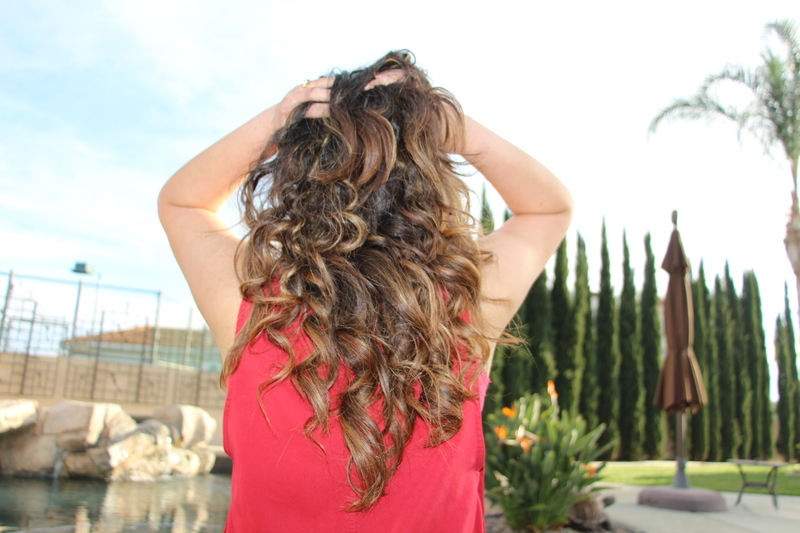 If you’d like another no-heat curls idea, check out these curls. With your fingers, separate a large portion of hair, by starting at your ears, moving towards the crown of your head. Section off with a band. Grab your headband, and put it around your head. It should rest on your hairline and right above your ears. Thinner cloth headbands are the most comfortable choice. Section off a 1″ section of hair. 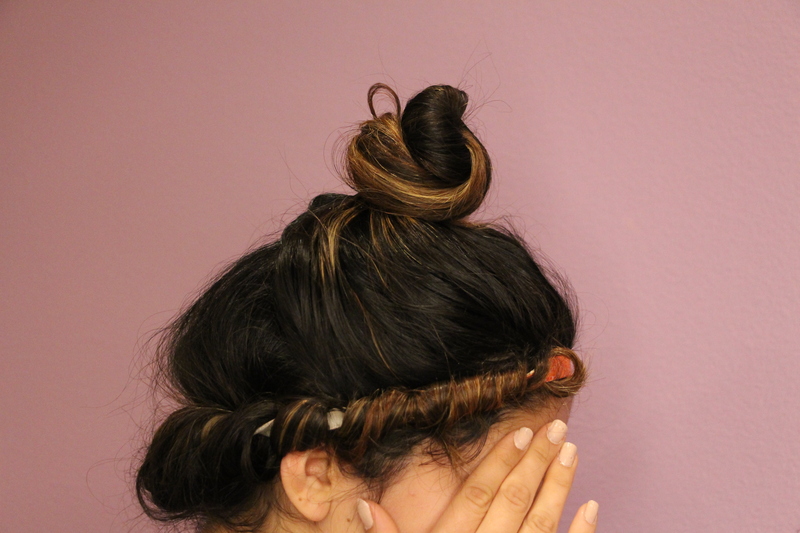 With your other hand, expand the headband, and loop the hair up and through it. 4. 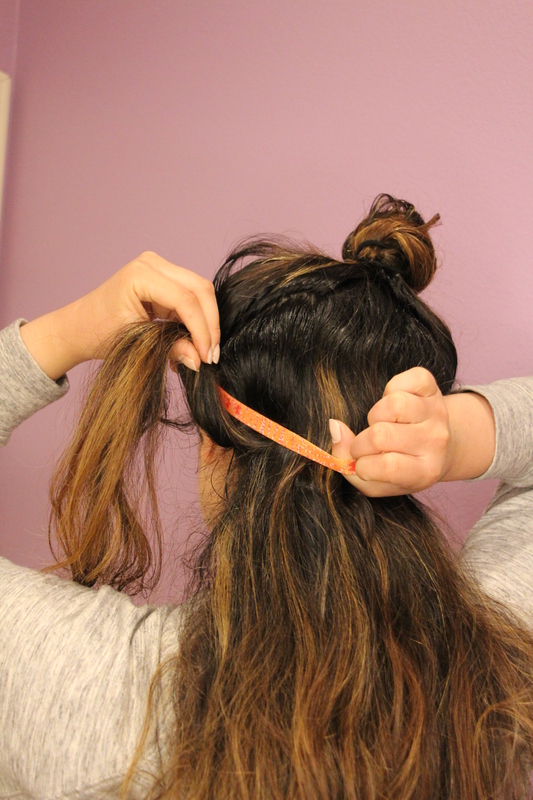 Then, add another 1″ section of hair to the first section. 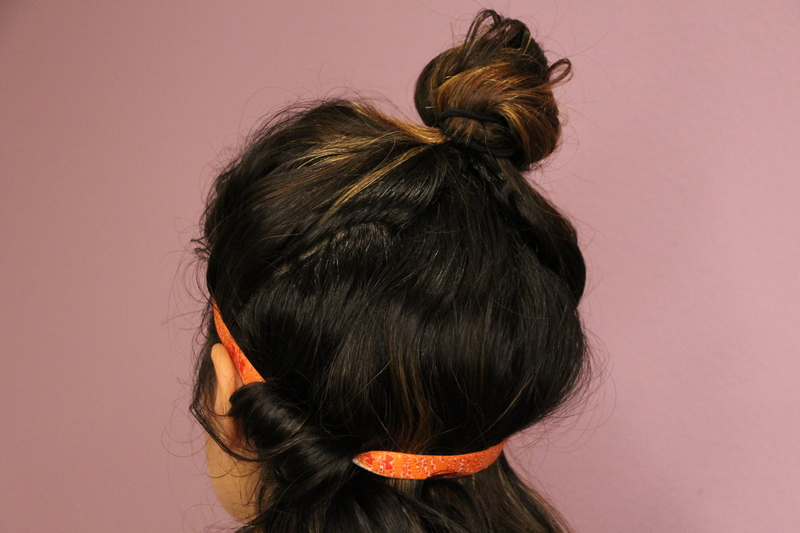 Loop the hair up and through the headband. 5. Keep adding 1″ sections of hair, and keep looping the hair through it. Gradually, the section will naturally become larger. 6. 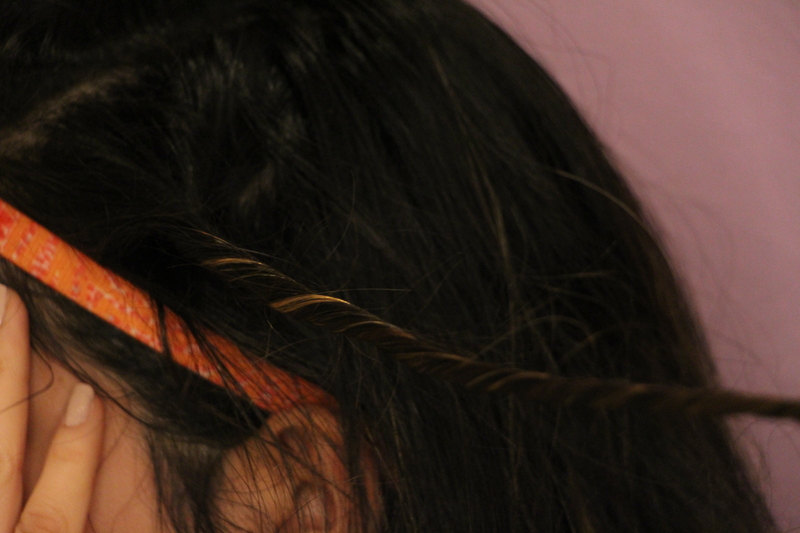 Once you’ve run out of hair to add, continue looping through the headband. If you have longer hair, the loop will continue up to your forehead. 7. Secure the twist with about three bobby pins, if necessary. These headband curls will add body to the hairstyle. 8. Let down the top-knot of hair, and part to your liking. I did a side part. 9. Section off a 1″ section of hair, and twist the entire strand. Make sure to twist away from your face. 10. 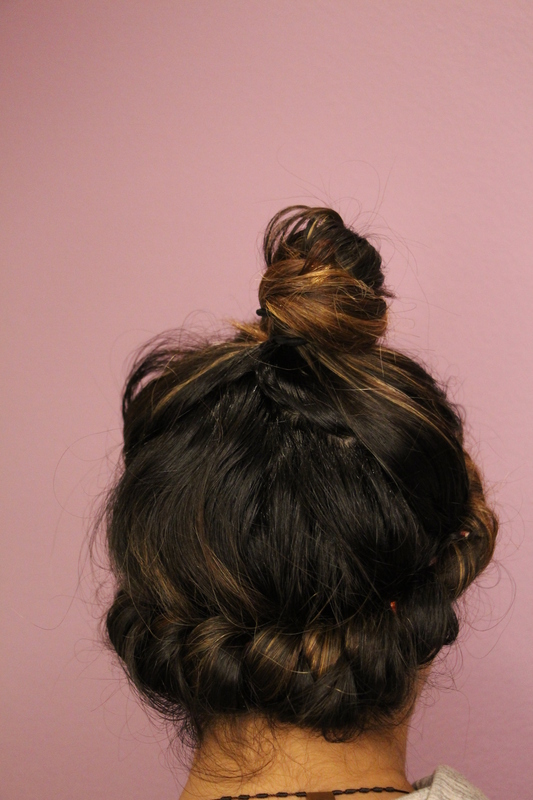 Coil the twist into a small bun, and secure with a bobby pin. These twist curls will add texture to the hairstyle. 11. Repeat steps 9 and 10 for the remaining hair, twisting, coiling, and securing. I personally recommend switching the sections up from 1-3 inches thick, since this will make the curls look more natural, like Moana’s. 12. Once you have coiled all of your hair, your hair should look a little crazy, but that’s okay. 14. 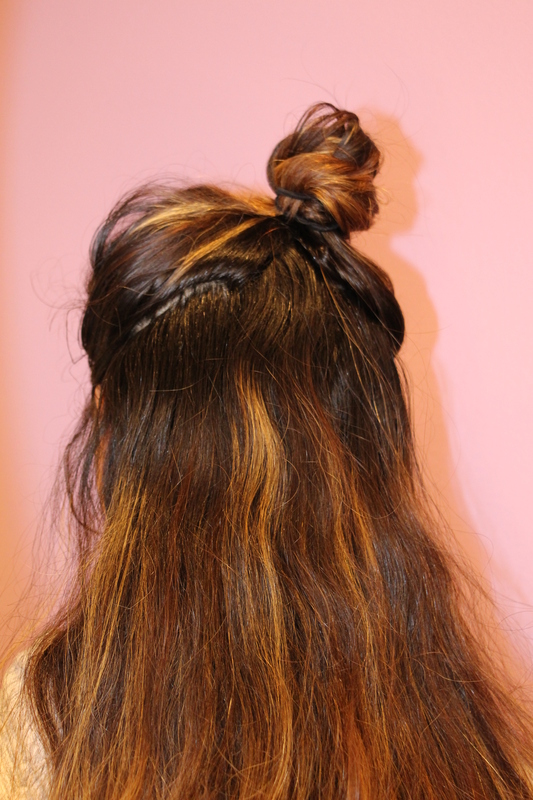 The next morning, undo all of the little buns, and uncoil your hair from the headband. 15. Separate the curls. Begin gently, and use your fingers, not a brush. 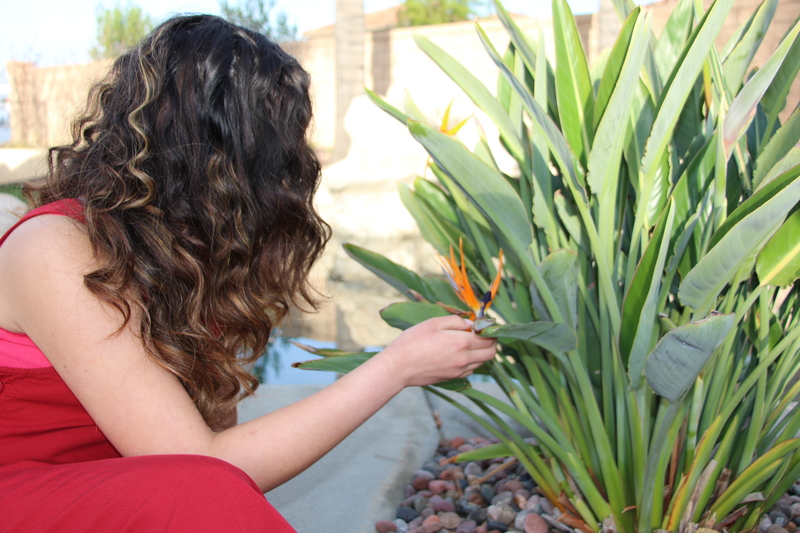 *tip* I like to let the curls rest for a few minutes, before separating them. …And there you have it! My take on Moana curls! I hope you enjoyed this hairstyle! What other princess would you be interested in me recreating her hairstyle? Prepping info: This all differs for each person’s hair type (mine is thick, with a slight wave,) but for some people, no-heat curls work better either on dry, slightly damp, or damp hair. For my hair, I like it slightly damp. You can achieve this by prepping the hair with either a hair mousse, salt water spray, curling cream, or simply a mist of water. I’ve used all of these in the past, but for the pictures you see above, I went for a salt water spray. It all depends on your hair and how well it can hold curl though. If you know that your hair does not hold curl well, prepping it is a must. Also, after you have undone, separated, and arranged your curls the following morning, you can add a bit of hairspray, to ensure that your curls stay all day long. I find hairspray is especially necessary for those with naturally straight or fine hair. Please remember that each of these curls can be used separately, so experiment with them, and see which give you the best results! This many coils worked for me since I have long, thick hair, with lots of layers. For thin hair: If you have thin or fine hair, I recommend only doing two coils on the top of your head, with the headband at the bottom. For short hair: You can still do this hairstyle, expect, when you do the headband curls, you might need to secure your hair with bobby pins, to keep it in place. …if you have any more questions, feel free to ask below! Hope you enjoyed the look! I love this!! It looks so pretty and full! I would love to see you do Belle’s ponytail style from Beauty and the Beast. AAAARRRRGGGGHHHH! 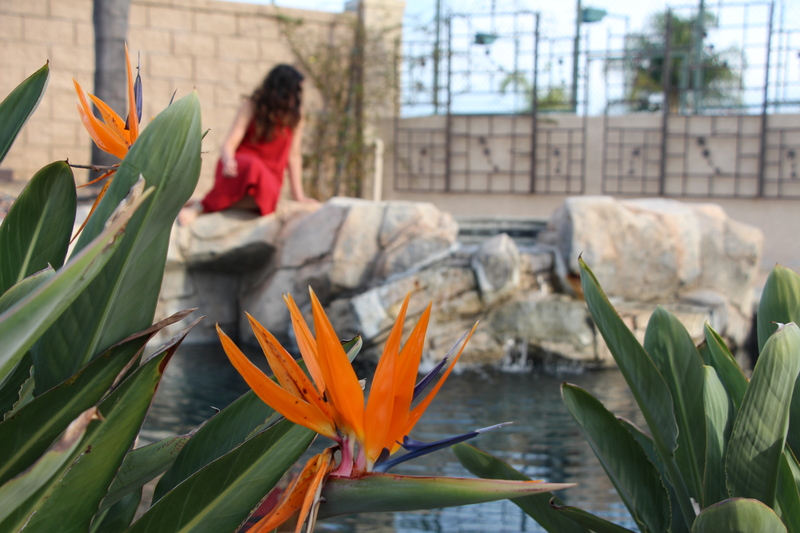 THE POOL AND THE NICE WEATHER MAKE ME WISH IT WAS LIKE THAT RIGHT NOW IN MINNESOTA! I do the headband heat-less curls on a regular basis and can attest that it definitely works. My hair is very fine and thin and is just past my shoulder. Do you recommend using some styling mouse or hairspray to help this hairstyle stay and should my hair be wet, damp, or dry? When I do heat-less curls I put a small amount of curling mouse through slightly wet hair, just to help it stay when I undo it in the morning. Wow Sophia, really cool post! 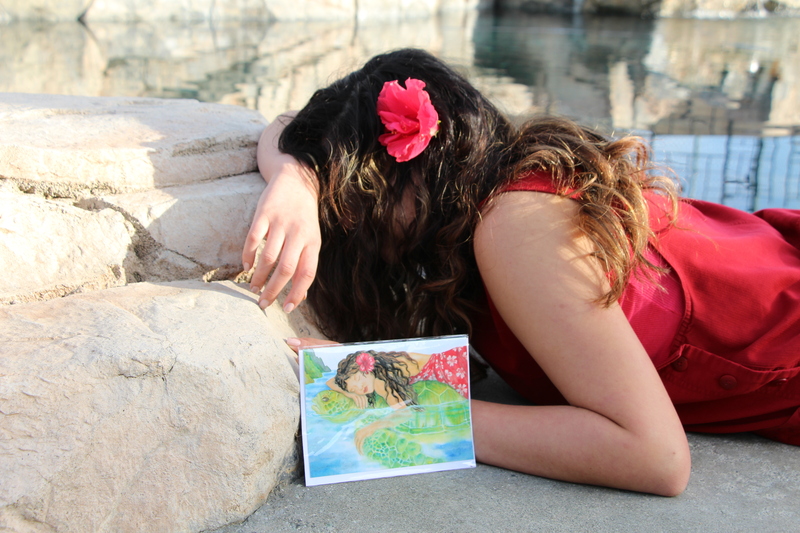 I really like moana’s curls!! Hi Maddy! Thanks for commenting! 🙂 I know right? Moana’s curls are so gorgeous! The second time I used bigger sections, to have a total of about 5 sections. Still, it gave my hair way too much volume and the curls looked very stiff and unnatural. Is my hair simply too thick for this? Or am I doing something wrong? The curls from the headband are lovely though, very natural and not too voluminous! Maybe I’ll just separate my hair half-up half-down and just use two hand bands to create headband curls for my whole head. I’m sorry that you haven’t gotten the results you were looking for. No heat curls can be tricky that way. I don’t think you are doing anything wrong! 🙂 I like the idea of the double headband curls, but I think that you might find it a tad challenging to keep both headbands secured and also not give you a headache! 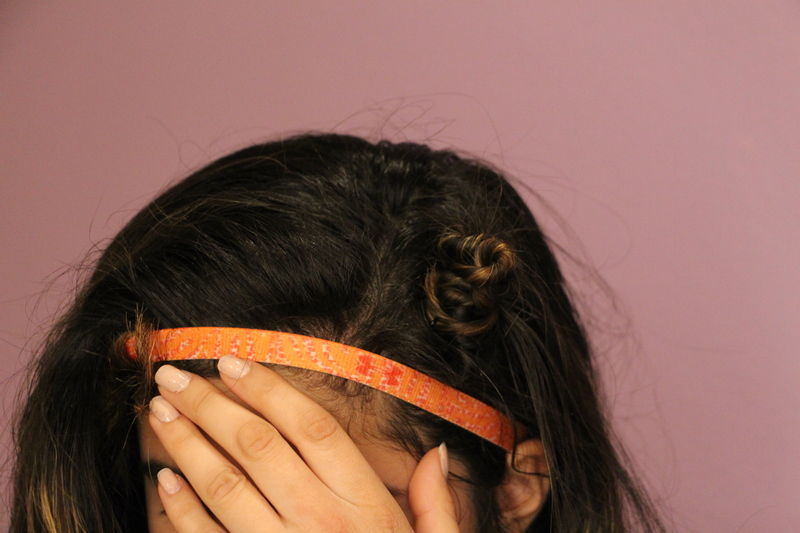 Have you tried putting all of your hair into the headband for the headband curls? I always think those curls look lovely. I think that would be the easiest option. If you want some extra texture nearer to the crown of your head, there is always the option of doing the headband curls, and the next day only curling a couple of strands with a wand curler, if you really want a specific type of curl. It would still be faster than heat-curling all of your hair, especially since yours is thick. Also, you can try sectioning your hair the same way, except instead of doing the coil curls on top, do a variation of this no heat curl https://setongirlshairstyles.com/2017/09/05/diy-overnight-curlswaves/ on the top. 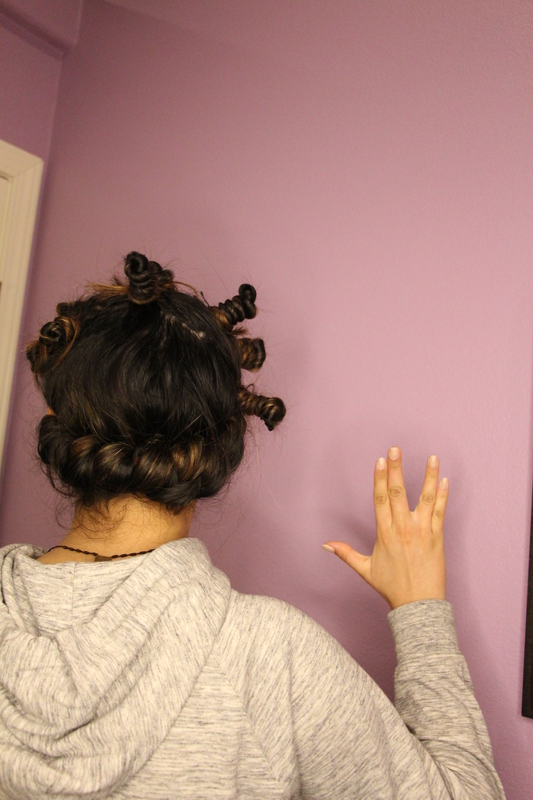 These curls shouldn’t make the hair so coiled and curly, but will still add some movement and spring to the hair. I wouldn’t do it too tight, that way it doesn’t look frizzy, though. I’ll definitely try out the link you posted though! I did have a little trouble understanding the instructions though for how you do the rope-braid. I’ll definitely keep a look out for the new tutorials! Thanks for all you guys do on this site! !